Dix’s sculpture of Nietzsche’s head is a depiction of swarming clusters of intense metaphorical transformations characterizing through the mutual imaginative echoing the philosopher-poet’s perception of the world of humankind’s destiny. Nietzsche’s bust is a combination of a strong head and a strong neck (without the second the first one cannot become itself) – without a potent stubbornness of the neck the head will not be able to develop and sustain its vision. Both are like two mountains combined by the imaginary logic of sculptural composition into wholeness. The cognitive power of human poetico-philosophical thinking (personified by Nietzsche’s intellectual phenomenon) is, by the Otto Dix’s inspired effort, ossified into this bony relief of a magnificently animated face and petrified into mighty neck. Nietzsche’s forehead is athletic like a rock. It receives the oceanic ebb signified by the philosopher’s dense and vital hair. But Nietzsche’s intellect inspired by the world’s energies – by the vital symbols of nature’s and human passions, by the primordial prototypes of human and culturally elaborated naturalness, is… over-exhausted by the task of trying to be the megaphone of the worldly soul. Over decades the cognitive power of Friedrich Nietzsche accumulated through his sinciput as his reaction on the wild: the oceanic energy waves (Dix’s analogy of Nietzsche’s hair with ocean’s waves), is transformed into a deep and hidden for years suffering of his soul spent on empathic observation of human and natural world. It took decades for this tormenting exhaustion and decay to tragically complete itself. The energy of Nietzsche’s philosophical concentration morbidly but inevitably transubstantiated into tears of sorrow – into a meditative life of grief and pain over human illusions, follies, cruelties, torments and despair. And looking at the bust we see heavily “teary” Nietzsche’s eyebrows and mustache – the bodily matter in a process of losing its materiality, its environment and its meaning. Nietzsche’s eyes which were sharper than the tops of mountains and more enduring than the gaze of the night are transformed into black holes, abandoned settlements of a mind which was alive forever. 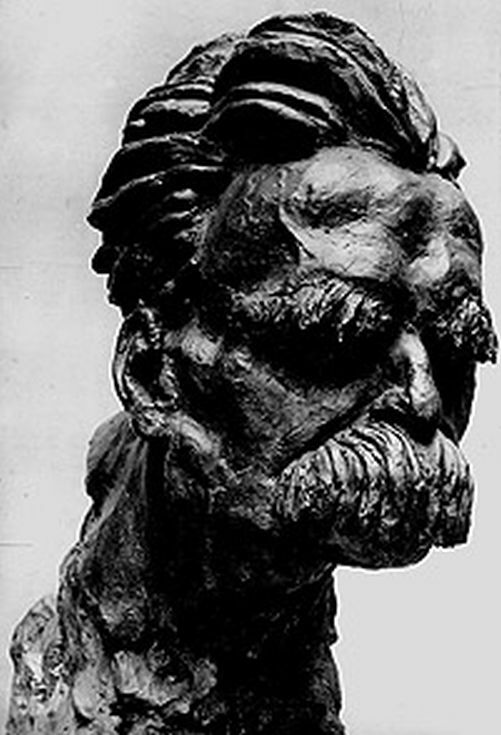 What we see in Dix’s sculpture of Nietzsche head is not only how a human being who was as spiritually inexhaustible as Nietzsche, became deadened, but how human reason itself can be shattered by the irresolvable contradictions between human civilization (with its spiritual ideological wrapping) and its barbaric seamy side, and by the very life in the universe, the very life of the universe. Nietzsche’s life and death gave chance to an exceptional artist, Otto Dix to feel the universe as if it is an incredible giant, tremendous and glorious, simultaneously smart and dumb, over-powerful and over-weak because its power itself is weakness and its smartness is inevitably stupid, as life is impregnated with death – carrying death and at the same time receiving it as a gift of redemption. And god then is, probably, just a robot inevitably smartly serving and controlling the crudeness of the very existence with its pathetic blind fight for itself, which carries its own destruction, like an optimistic cheerfulness – its pessimistic inner layer.